I pulled an all-nighter getting ready to leave for Colombia. Not feeling too bad for as little sleep as I’ve had in the last 48 hours. I can tell Dylan is excited for this adventure in pretty keyed up. The group coming from Dallas is great. Josh, Cheyenne, and Cory came from Hico, Texas; Shawn and Michelle came from Richardson; and Tonya came from Garland. We made it to Panama with no problem, thankfully. Dylan watched TV on the flight the whole time (eight dollars for DirecTV plus movies-journey to, etc.). We had a short, two hour layover in Panama on and ate lunch at Carl’s Jr., and then got on the plane. We looked for our missing guy coming from Missouri –Travis – but found out later that he missed his flight, or was delayed by something. The flight to Barranquilla was uneventful. Dylan and I slept pretty much the whole 1 hour flight. We got through customs check okay and by the time we got up to the bag checkers, they just waved us through without digging through our stuff! We had to wait on another part of our group that came in from Atlanta, GA. All in, about two hours after we got off the plane, we got on the bus to drive to the Hotel Majestic. Driving through the streets (after Dylan and I played some Mad Libs – we picked up two of them in DFW and it has been a fun way to pass the time) I could see that Dylan was shocked by the surroundings. Very dirty streets and people living very differently than us. We got to the hotel and hung out waiting for the luggage truck to arrive, when all of the sudden, Dylan realized that his iPhone had slipped out of his pocket. We searched through everything and our e3 Columbia team lead, Bernardo, called the bus driver. Meanwhile we went upstairs to drop off our luggage and we talked through this loss. We took a quick break to call mom via Skype, and he started to tear up. It had been a long, and emotional day so far. We talked about the fact that God knows exactly where his iPhone is and he can bring it back to us! Dylan was upset and probably mad at himself for losing it. We prayed that God would bring it back. We went to dinner – walked over to the mall, which was about 4 – 5 blocks away. We ate at a place called Crepes & Waffles. Dylan had a jumbo shrimp crepe and I had a beef crepe. Both were awesome! 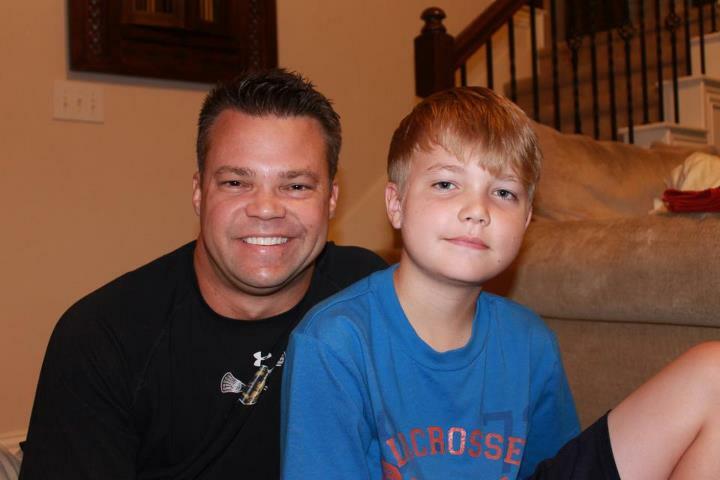 We ate with Scott & CJ Fletcher, who will be on our team all week, from Firewheel Church. During dinner, Bernardo came over and said that the iPhone had been found! He told us that we would reconnect with it on Sunday. God is good! When we got back to the hotel to get ready for bed, Dylan accidentally rinsed his toothbrush in the tap water that we were not supposed to use, and used it for about five strokes before I clued in to what was happening. Lord, please keep his body well! 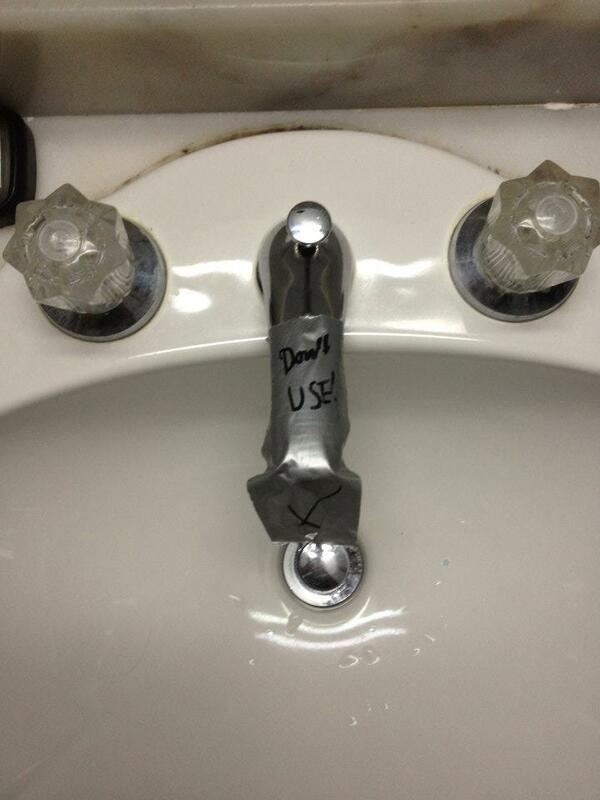 We now have the sink duct taped for memory sake! There was a great time of fellowship with the churchgoers there. We went back to the hotel and then walked to lunch at the mall. When we got back to the hotel, we had more preparation meetings during the afternoon, and then got to meet our translators that evening and spend some time getting to know them. Renan, Juan, Alejandro, as well as Pastor Luis for the church in Don Bosco area we would work with on Monday and Tuesday. 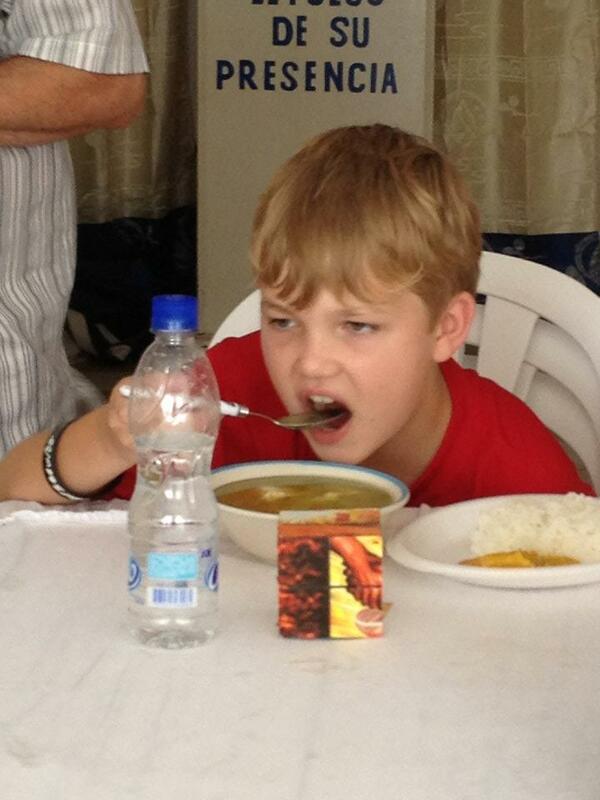 That night, we all ate at the mall, Dylan and I had Asian food…in Colombia? Si! What a great first day! Sam’s talk again was awesome. Sam mentioned a quote that would become a sub central theme for the week… “Fear is the devil’s scarecrow in God’s cornfield. (What is it? A lie! It’s nothing, it only looks like something!) Any smart crow knows, where there is a scarecrow, there is really good corn!” Sam encouraged us by saying that this week is not about us. It is about what God can do with us in this, and through us. That all week, we will have divine appointments and defining moments. Then Vicki, Sam’s wife, led us in a “concert of prayer” which was just fantastic. Dylan and I especially liked praying through “putting on” the Armor of God (Ephesians 6:10-18) and the discussion that followed. Vicki said that just like the waiters who came to work in their street clothes, they then changed into their uniforms (with a different attitude and authority) to go to work. In the same way, we should “put on” the Armor of God when we get ready to go out into the field to do His work. We got on the bus and headed out to our location. 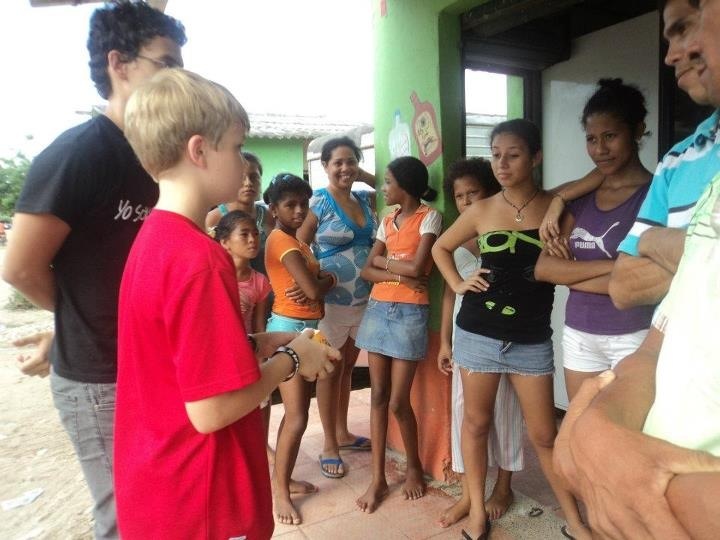 The neighborhood we went to was very poor and it was very sad and a little shocking to see the living conditions. There were stray dogs everywhere, trash everywhere… General all-around squalor. The church had no front door, cinderblock walls on the left and the right, and a roof that was made out of a patchwork quilt of tattered tarps. We did a little EvangeCube training, broke up into groups, prayed, and when out. We had three American-led teams and between 2 to 4 Colombian-led teams. Dylan and I only went to two homes in the morning (we only had one hour to work with by the time we left the church) and at the second house, Roxana trusted Christ! Dylan went through the Cube and Renan helped to close in prayer. It was very cool to watch – you can see some of it here…! We had lunch – chicken, rice with Coke to drink. As Dylan said, “very surprised how good it was!” Dylan has been so entertained (and entertaining!) here and is very engaged. He loves what he is doing. During the siesta time, Dylan made towers out of water bottles and cracked jokes. We did a little I Am Second/Yo Soy Segundo (IAS/YSS) training (Daniella did all of it) and then we went back out. The first house we stopped at we never got off the porch for about one hour! For people trusted Christ on the porch! One lady, two boys, and one man (a cousin of the lady). The next house we went to we talked with a 56-year-old lady and her niece who is 12 years old. Both of them trusted Jesus as their Savior. We learned that the lady already had another young relative share the EvangeCard with her! “I have seen these pictures but not the cube” she said, which was confusing to me at first, and then at the end, she said it all made sense. The next house we went to had one girl, two boys hanging out up front, with the adults just inside the house. Quickly however, it turned into about 20 or more kids and a couple of adults hanging around to hear what was going on! I bet we had close to 20 people who trusted Jesus as their Savior right there! I didn’t have enough to E-cards to pass out! We went back to the church to set up for the IAS/YSS groups and to tally the numbers from the day. It was a fantastic first day of evangelism. 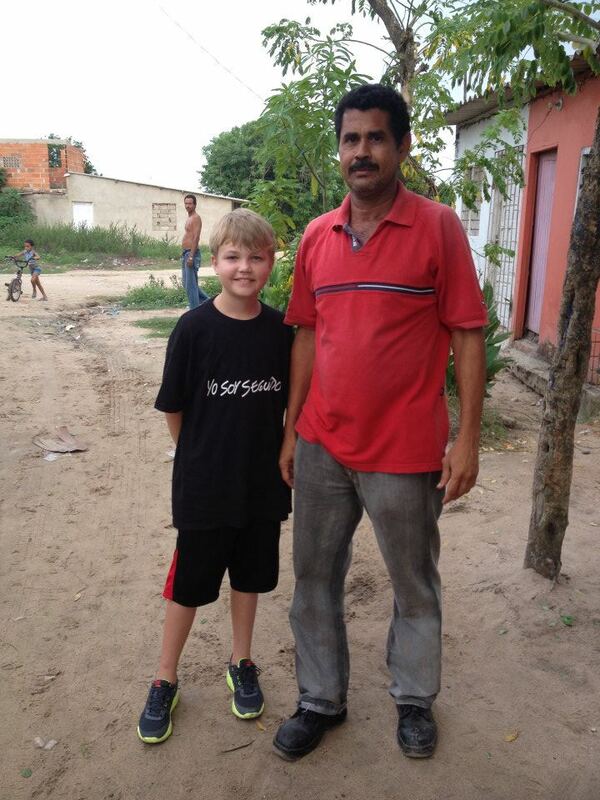 While I was counting up the numbers, Dylan slipped next door with our translator, Renan, to share Jesus with a man who was hanging out just outside. That boy has a fire and passion for the lost! After a little bit, as we were leaving, Dylan said that he was sad to go. He wanted to stay and keep going. Wow! Pastor Luis was thrilled. “Bien Trabajo!” and said that there was much to follow-up on! Very true. We all loaded up in the van at about 6 PM, and headed back to the Hotel Majestic. We were all tired, but full of stories and thrilled with what we saw Jesus do today. We took the translators to dinner (El Corral), for burgers at the mall. We all had a great time, and then headed back to the hotel. At the beginning of the day, Dylan said that his goal was that he would get to lead 10 people to Christ, or, at least that our group would be able to do that. Jesus not only met our goal but totally blew it away. Can’t wait to see what He will do tomorrow! Sam and another e3 staffer, Joshua Yarborough spoke during breakfast. It was fantastic. 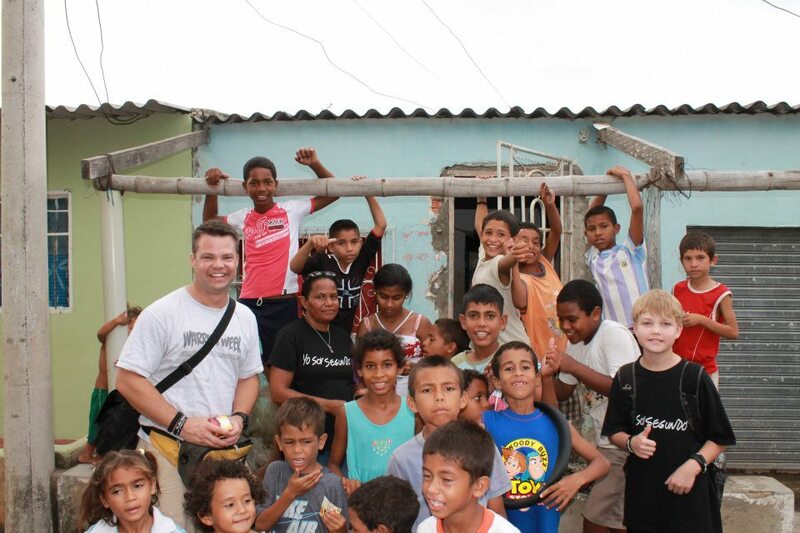 The work that Joshua is doing for e3 Partners in conjunction with community transformation is very inspiring. The group Dylan sat with very encouraging about our father/son trip. They thought it was awesome to see Dylan doing this at his young age and having these foundational experiences! I can’t wait to see what God will do in his life with this, and hopefully many more trips in the future. When we got back to the room after breakfast, we stopped down to “pray on” the Armor of God on just like we had done on Monday. After lunch, Cory got there with Josue & Miranda. We set up in the busy section of town and it was a huge hit! Dylan and Renan lead a group of 21 people to Christ by themselves! I got to lead a huge group of about 30 kids to Christ at once – many of whom raised their hand that they had accepted Jesus as Savior. We got the lead a guy on a bike riding through the intersection and a guy on a motorcycle similarly to Christ. Anyone who stopped long enough to see what we were doing, for the most part, got to hear the gospel. There was a pool hall right there on the intersection across the street from where the street artist was drawing. I got pulled into talking with the guys who were in their shooting pool and drinking beer…kind of a tough crowd! I made the comment to them, “it’s no coincidence that I am here, and it’s no coincidence that you are hearing me today.” We presented the Gospel to them with the Cube and said that if anyone wanted to pray to trust Jesus as their Savior with us, that we would be in the back to do that with them. We didn’t have any takers, unfortunately, but not too surprising given the surroundings at the time… Lord, I pray that these men who heard the gospel while shooting pool and drinking beer, would come to know Jesus as their Savior. Please put someone else in their path to continue the conversation! We went back out into the street and talk to another small group of people where four people trusted Jesus as their Savior. Then we went back to the church were we had the kids service. Dramas (the fireman’s carry gospel presentation and a couple of other Colombian led dramas) were enjoyed by at least 50 or 60 kids and some other adults in the audience. At least 40 kids by my quick count trusted Jesus as their Savior, I think. It was awesome! Also, there were about 12 new people who came for the IAS/YSS groups – many were the parents of the kids who came to the drama. It more than quadrupled what we had on Monday! This marked the last day that we spent in Don Bosco. A really sweet time with wonderful people… And a ton of new brothers and sisters in Christ! Before we left, we got together as a group with Pastor Luis and prayed over all of the names that we had gathered on paper. We also prayed for Pastor Luis and his team to have the courage and stamina to follow up on all of these people in the lives would be changed forever into the future as a result of the days that we spent there. That is all up to Jesus! But we were thrilled to be a part of what he did over the last two days in Don Bosco… Absolutely cool. For dinner, guess what? We ate at the mall! For dinner, we decided on pizza and then headed back to the room. We got to talk to Ellen on Skype for a few minutes, which was sweet. Another awesome day! Sam’s talk this morning over breakfast again was awesome, challenging and very rich…hard to digest in one sitting. The president of the e3 Partners also made a surprise visit. Curtis Hail brought another new church planter recruit in the field with him to show him what a “traditional” E3 mission trip looked like…because he was headed to the Middle East, where campaigns are run differently and have to be done more secretively, for fear of persecution. In Curtis’s opening comments, he announced that he was celebrating 20 years since he had recruited Sam Ingrassia to the mission field, on staff with Global Missions Fellowship (the original name of the ministry prior to the name change of the e3 Partners). 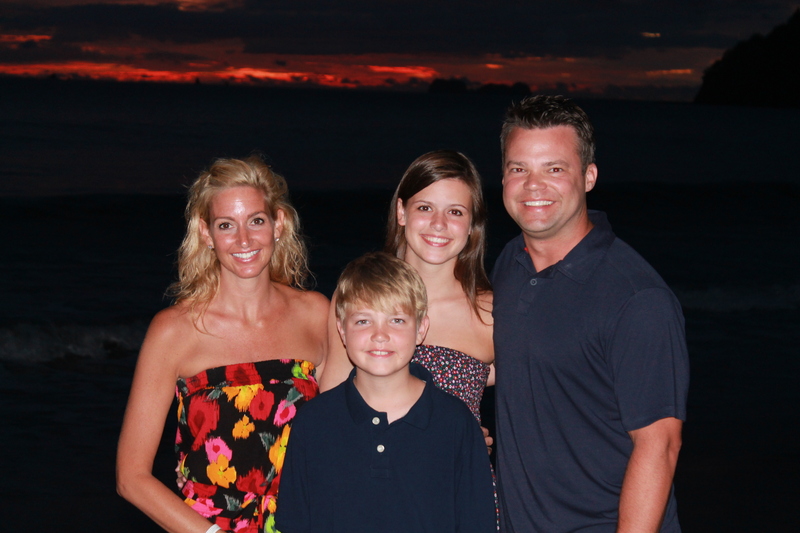 I was deeply impacted and moved as I thought about how thankful I was for Sam. God has used him in such a mighty way in my life personally, and in my family’s lives collectively. I am so thankful that he answered the call that God placed on his heart 20+ years before. I am part of the fruit of Sam’s obedience! We went to the Soledad area for work today. We met up with Deysi Orozco, the pastor’s wife, who led us throughout the day. She went with Renan, Dylan and me door-to-door. In the morning, Dylan and I got to lead eight people to Christ! In the afternoon, we only hit two homes – as the first home took about an hour and 45 min. Neban and his friend were home watching a soccer game with knee bonds mom and grandmother. 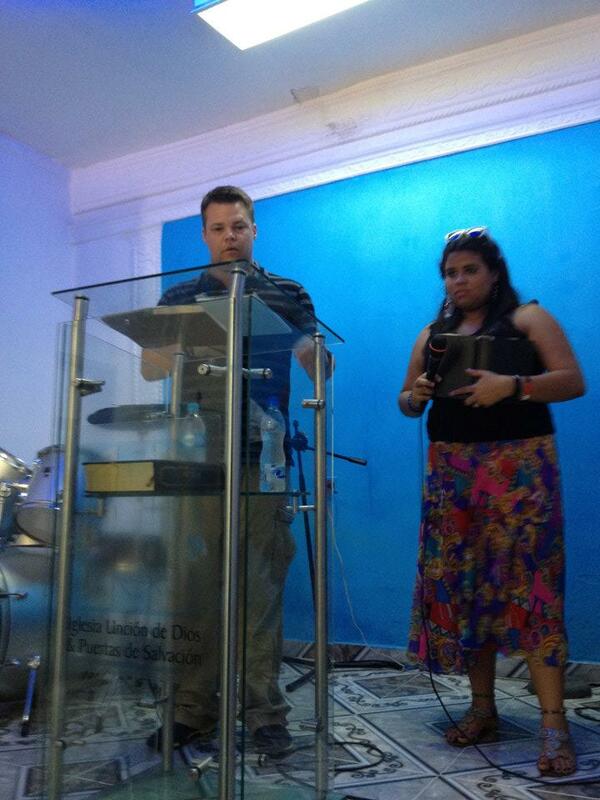 We came to understand that through Deysi that they were Christians already. Dylan shared the Cube with them, but we spent most of the time discussing how they were disenchanted with the church in and with Christians in general. Neban had been disinterested in engaging in spiritual things, however, he also shared that he had seen visions a few years ago that had scared him. So, he had not been following God at all, mostly out of fear, and had fallen in love with the party lifestyle. We found out later that he had married a girl…but was now separated from her. I encouraged him by talking about how it is important to know who you are, know who you are in Christ, know about spiritual warfare and the authority that he has in Jesus, etc. We then prayed over him and the family and went on our way. Next we visited the nicest looking house on the street, and went in to talk with the young lady who lives there. Dylan led her to Christ! We then went back to the church and got ready for the IAS/YSS groups. No one showed up by the time we went back to the hotel, but found out that after we had left, about two or three people showed up for the groups! Praise God! For dinner, (you guessed it!) we ate at the mall again and had El Corral & the Asian food place again. We were becoming creatures of habit! Weather that has been bearable. There has been lots of cloud cover and some cool breezes along the way. Not a ton of walking. All the houses are very close together and the people invite you in to sit down and to get out of the sun (or to sit down in front of the fan). This is been awesome to save Dylan’s feet! We got up early this morning and participated in the concert of prayer that Vicki Ingrassia led. A very neat experience to collectively pray as a group through many things. We went to breakfast, and Dylan had to leave early from Sam’s talk behalf because his stomach didn’t feel well and he needed a bathroom quickly! Sam was talking about the book Red Sea Rules and has put a PowerPoint together about it. I got Dylan situated in went back downstairs for the balance of the talk. I stayed after to talk with Vincent, one of the team members who came from Atlanta. He has said all week that he and his group have been talking a lot about how cool it is that Dylan and I are doing this together. And it has been a neat model for father to pass to son on how we do things as Jesus followers. I went into it’s a little deeper with Vincent to tie in how we know Sam, etc. (See Lauren & Jason Loveless Romania 2007 trip blog) I really like him and wish we could spend more time together. Went back up and got Dylan situated in headed out to the Soledad/Salamanca area again. Dylan still wasn’t feeling that great, but wanted to go out door-to-door anyway. We went to the first house and shared with a guy named Roy and Rafael (Rafael was sitting down at first when we got to the door, and then got up to hear what is going on). Both of them trusted Jesus as Savior – awesome!, but Dylan was wilting – not awesome. I took him back to the church where we got him to lay down, drink water (Deysi ran to get him a sprite) and eat some crackers. 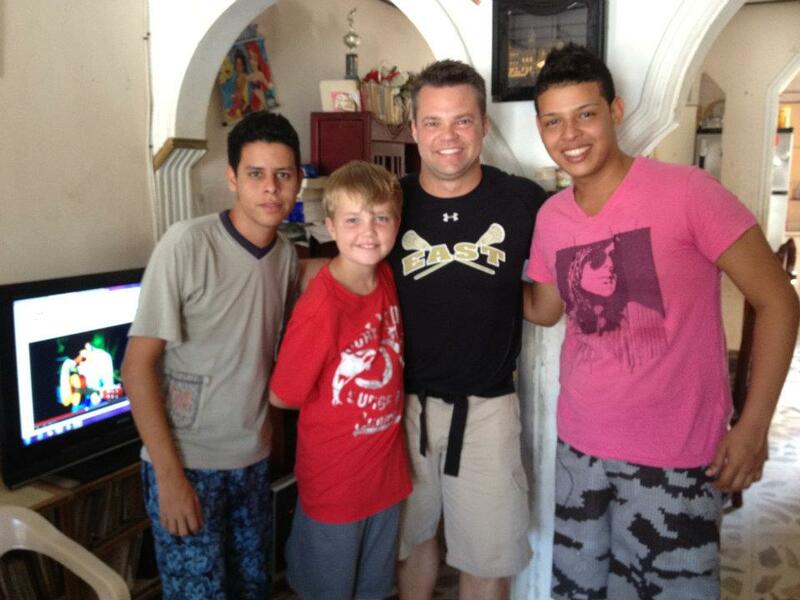 I sent Renan, Deysi and Wendy (one of our new translators today) back out to go door-to-door and stayed with Dylan. He and I did a few Mad Libs to pass the time and I prayed for God to heal his stomach issues and for the enemy to be bound! Dylan wanted to make a go of it in the afternoon and was rejuvenated by some chicken soup that the ladies at the church had made especially for him. He came out of the gate and shared with a couple who both trusted Christ! Next, Dylan led three ladies to Jesus a few doors down, which was very cool to watch. Next, we went across the street and talked with the lady he was getting her toe nails done (a captive audience-awesome!) And while we shared the Cube with her, her husband came out to sit with his wife and another friend who happened to come up and was visiting. I presented the Cube to everyone there. It turned out that the husband and his wife were already Christians, but their friend was not. I told her that, therefore, we were there to talk to her J! She ended up trusting Jesus as her Savior and was able to present the Cube it back to us using the E-Card. We then headed back to the church to set up for the IAS/YSS groups. About five people came! While we were waiting to leave, Juan led a little girl to Christ, and she started playing with & presenting the Cube immediately. It was very cool to watch. We got back to the hotel, and then went back to eat at the mall. Our group got split up for a few minutes, and while Scott was looking for his wife the CJ, he started up a conversation with a couple of guys there who were hanging out…and lead them to Christ! Dylan got his fill of his new favorite drink again (Quattro), and I had El Corral again (hey, it’s really good!) and went back to hit the sack. Friday is our sightseeing day! Dylan woke up not feeling the best, but wanted to go ahead and go with the group. We had breakfast, settled up the money with Sam, and got ready for the day. Thursday night, our group decided that we were going to a local, well known museum, followed by lunch and shopping at the open air market. (Dylan got a shark tooth necklace, and a hand grip “exercise thing” that shocks you when you squeeze it. He had a blast tricking people into squeezing it and then watching their reactions! It was pretty funny!). We had a good time, and it was fun to treat these translators who did a great job of taking care of us all week. As we wrapped up the day, Dylan was hitting the proverbial wall. Scott and CJ took Juan and Daniella for ice cream, and Renan escorted Dylan and me back to the hotel. Dylan and I crashed for about an hour. When I got him up to get ready for the victory service we are going to go to (celebrating all that Jesus had done through us that week) he said he just couldn’t make it. He was pooped. At first, I wanted to have him try and power through it, but on second thought, thankfully, decided against it. He had done so well all week! We got packed up and were going to try and wait up for everyone to get back and talk with them, but Dylan fell asleep and I decided not to wake him. Not the greatest finale to our trip, but we really did have a great day. The alarm went off at 2:50 AM. Got Dylan up and we got ready and went downstairs. Dylan had the pleasure of waking a few people up with his shock grip the thing that he bought at the market on Friday, and started to strategize on how he would treat his sister when he saw her next. We loaded the luggage, loaded onto the bus, and begin the trip to the airport. We made our flight and much later that day, were able to connect with Ellen & Lauren in Costa Rica – a wonderful blessing of a trip as well! Being “on mission” in Barranquilla, Colombia has been a fantastic trip, filled with marvelous “Jesus sightings” all week. It was absolutely a blessing and a privilege to be used in such a mighty way all week long! It was also great to watch Dylan step even further into the “kingdom warrior” role, and fighting for the hearts of the lost…passionately. 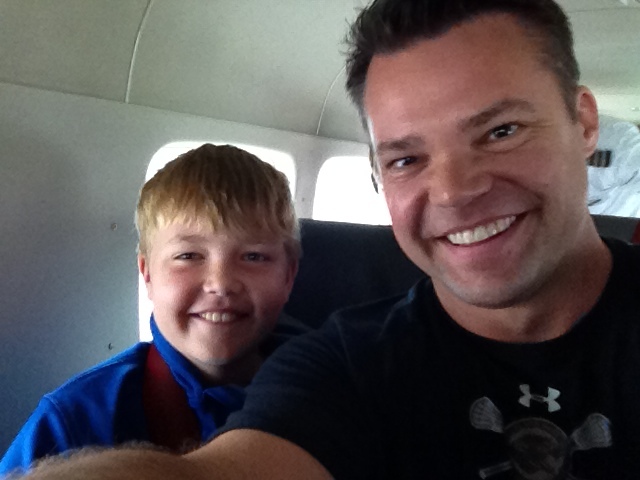 Of these, Dylan & I got to share Christ with about 191 people! Of these, Dylan & I were a part of about 119 people who trusted Christ! 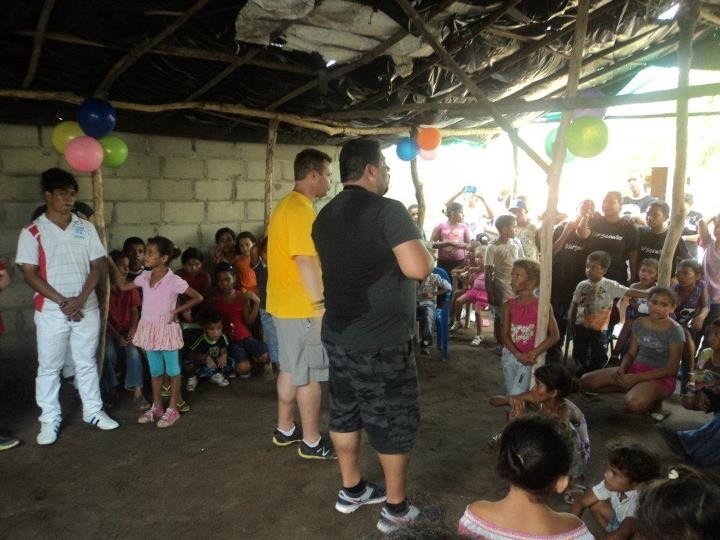 Prior to our arrival on Saturday, June 23rd, there was an I Am Second/Yo Soy Segundo youth rally, hosted by e3 Partners and attended by 800 young people. 306 of the attendees committed to start Yo Soy Segundo groups in their spheres of influence. Thank You Lord for a wonderful time in Columbia! Thank You for bringing us alongside the work You are doing there, and using us as You saw fit. I pray that the ripple effect of the work done in Columbia would be felt for generations into the future. You touched thousands of lives through us directly and indirectly, and we look forward to hearing the rest of the story throughout eternity. I pray that You would watch over those who are our new brothers and sisters in Christ, giving them eyes to see and ears to hear all that You are doing in, around, and through them. Grow them up in Christ quickly. 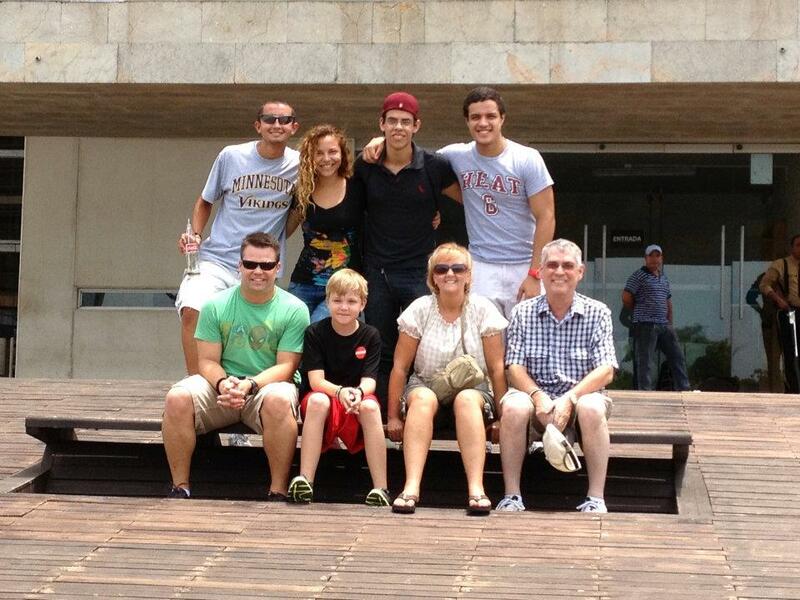 Thank You also for the eternal impact this trip has had, and will have on my own family. I pray that we would not forget to remember all that You did, and that we watched You do in Barranquilla. What a truly wonderful and awesome experience to be a part of. We love You! In Jesus name, Amen.